Five simple farm-fresh ingredients — a luscious indulgence. 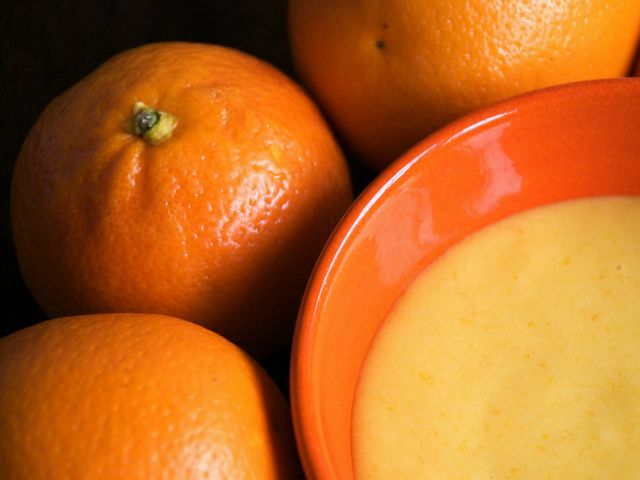 Pour the orange juice into a small saucepan, and cook over medium-high heat until reduced to ½ cup. (Have a liquid measure nearby so that you can check the volume as necessary.) Set the reduction aside to cool slightly. Fill a small pot one-third of the way with water, and bring it to a boil. In a medium metal bowl, whisk together the egg yolks, sugar, and orange zest. While whisking, slowly add the reduced orange juice until completely incorporated. Set the bowl over the pot of boiling water, and reduce the heat to medium-low. Whisk constantly for 6 to 7 minutes, or until the curd thickens and holds its shape when stirred. (You can also do this in a double boiler.) Remove the bowl from the heat and gradually stir in the butter. Set a metal bowl into a larger bowl of ice water, and strain the curd through a fine-mesh sieve into the smaller bowl. Stir the curd occasionally until it is cool, about 5 minutes. Transfer the curd to a small container, cover with plastic wrap, and refrigerate until well chilled. Use within 1 week.